Hi to all our wonderful supporters out there. Ita��s time for an update from south east Queensland. 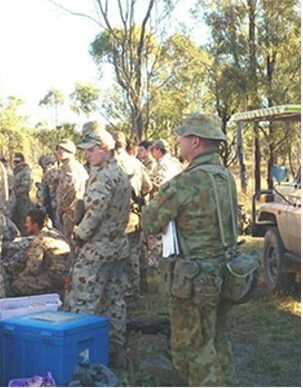 9FSB my supporting unit, and 6ESR have invited me to join them on their ACCPP exercise to Alice Springs this year. What a blessing! I have never done an ACCPP before but Ia��m looking forward to the dusty and hot times out there. I will give you all the good news on the happenings there on my return. The brew truck has needed some work to prepare it for the long journey, and I wou…ld like to thank 9FSB and 6ESR for the fitting and wiring of solar panels and new tyres for the trip. Thanks again guys! Ia��m away for 4 months, so please remember to pray for me and my family while Ia��m gone. Over the past 4 months I have been serving the troops at Wide Bay, Canungra, Greenbank, and Enoggera. My message to the troops remains the same. Ita��s all about the free gift of Salvation through the Lord Christ Jesus. I remember one young man who approached me with this question? a�?Do all religions serve the same God?a�? I told him that the God I serve is the God of the Bible, and He offers you a free gift. a�?Whata��s that,a�? he said. I told him that the God of the Bible said that all now need to repent of their sin, turn away from doing evil, and call on Him and they will be saved. I said. a�?Read Romans 10 verse 13 in the Bible.a�? a�?Ia��ll take a look latera�? he said and went off to finish his task. I stood there thinking about what just happened, and remembered saying a prayer for him as he walked away. I thank you that every time you give to Everymana��s, you are making this possible.